Waitrose Lemon and Garlic Couscous. Heat 1 tbsp olive oil in a frying pan, add 1 clove garlic, crushed, and cook for about a minute. Add a pack 4 Waitrose British Pork Escalopes (about 400g) and fry for 4-5 minutes on each side until golden and thoroughly cooked. Add the finely grated zest and juice of 1 lemon and ½ x 20g pack flat-leaf parsley, chopped. 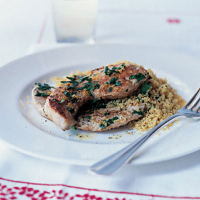 Season with freshly ground black pepper and serve with Waitrose Lemon and Garlic Couscous.